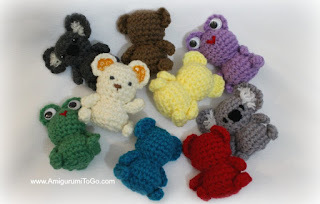 These little guys are quick to make.They're a great little project to bring along to a doctor's apt or anywhere you'll be stuck waiting for a bit. If you're worried, make a Lil' Trouble Teddy or two, they will keep your hands busy and your mind occupied! I designed more patterns for this Lil' Trouble series including a tree. 4.25mm hook for limbs *this is optional, you can use the same hook for the entire project. If you want the ami to be the same size as mine then use what I used. If you don't have a 4.25 then use a 4mm or a 4.5mm hook. *stuff head firmly and full. Shape as you stuff. If you have any troubles with the next part of the pattern please view part two of the video tutorial. *optional for frog: I thought thinner arms looked better on the frog. I made 2 chains of 8 for the frog arms, folded the chain and sewed it closed same way as instructed below. The frog legs are the same as instructed below. 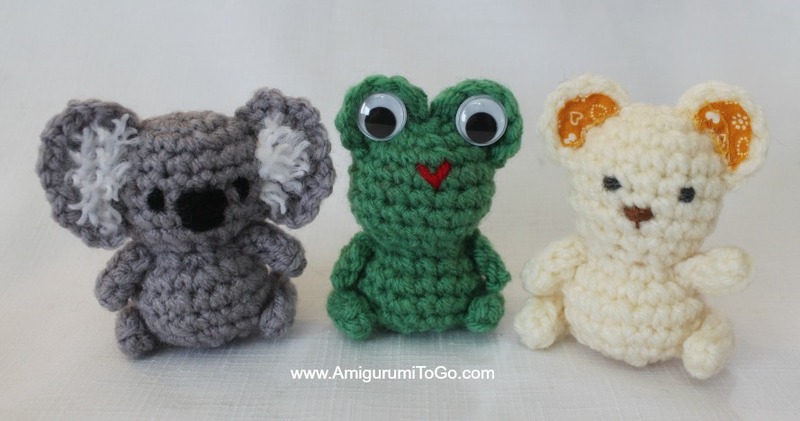 Tip: I would sew the limbs on before crocheting the ears or frog eyes onto the body. I used the arms as a guide, making sure the ears or frog eyes are in line with the arms. ch1 then make 3dc in next space then 3dc in next space after that . sl st just in front of the last dc you put in. f/o and shape the ear, stretch them out. Pull the yarn tails through a st in the back of the head and pull on each, this will help shape the ears a bit more. Once you're happy with how the ears look, knot the yarn tails together then hide in the head. 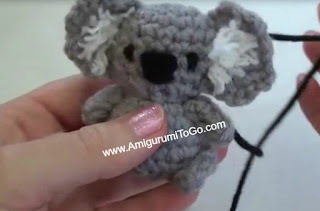 The koala's ears get an extra row added on. Insert yarn in between the head and edge of ear, ch 2 and 1sc into first stitch, ch2 and 1sc in next st, repeat until you have no stitches left. sl st into head and f/o. Hide yarn tails in head. For the inner white parts. Cut 3 strands of white yarn, knot them side by side in the middle of the ear. Cut them to desired length, fray the strands by splitting them with your yarn needle. If you're worried about them coming loose, add a bit of glue behind them. Let dry. For the faces, I inserted black yarn where I thought the koala nose should go, wrapped a number of times then hid the yarn tails in the head. The eyes are yarn again, wrapped around the 6th row. The frog eyes are glued in place. I added in a red strand of yarn for the mouth. Same techniques used for the bear face, I just kept it simple. Google images and get ideas for your little Trouble Teddies. OR leave them faceless. Play around with different things, use buttons or felt. Add fabric to the ears as I did for a couple of them. I just glued the fabric on with tacky glue. You may sell finished products. If you'd like to share this pattern please link back to it. These little ones are so cute. I love th tiny koala the most. Thanks for sharing the pattern. Thank you very much for this cute pattern! 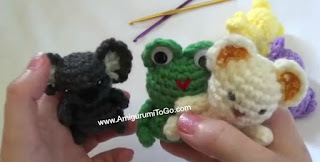 Will you be posting a pattern for the mouse and the elephant? Hi Sharon -- I love all your creations. I just started on the Teddy Bear. I hope I can get through it and it looks nice. So glad I found you. These are precious! I will not be able to make before Christmas - but have saved patterns and will make later for my Granddaughter! I know she'll love them! Thank you so much! May you and your family have a Blessed and Beautiful Christmas! Thank you for this and all of your other free patterns. I certainly appreciate your time and effort for sharing this amazing craft. I truly love being able to have a printer friendly copy next to me when doing each project. Can I use thread or safety eyes instead of yarn? Thanks! for sure.. I can't see why not. You should put in a penguin! 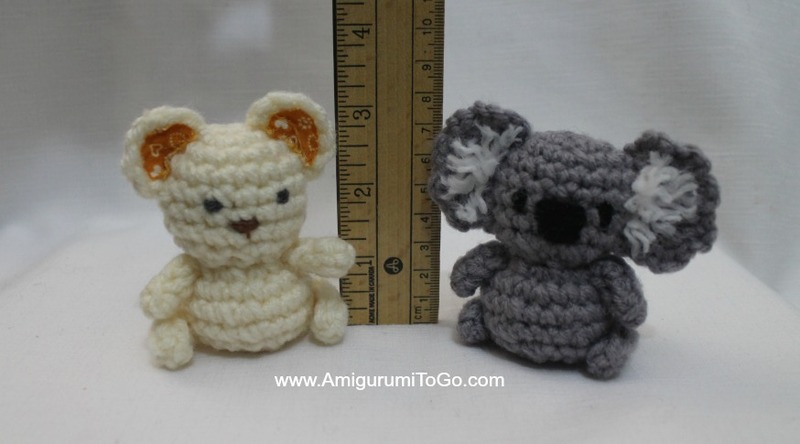 Yoo have adorable crochet items!!! I simply adore your little trouble teddy but I did make a few modifications and turned him into a xmas ornament. I changed most of the appendages based on what you've taught me (cause you're amazing!) If you'd like to work one up and add it as a modification (free pattern), I have no problem with that :) I wish I had the money to donate to you but I am poor :( LOL but I have been to some craft shows lately and I've pointed lots of people in your direction! Hopefully that will pan out for you. For the legs I did ..
Magic circle with 6 scs then 6 sc for 2 more rows (3 rows total) - again stuffed with the magic circle tail and trimmed off excess. These are very tiny pieces obviously and your trick to use a pencil eraser really got me through it! For the tail I did a magic circle with 6 sc's, then one row of SC's just so it's slightly bigger than the nose. I again used the magic circle (beginning) tail to stuff. For the ears I used your pattern for the mouse ears. To add a scarf, I just chained 25 and finished off. I weaved backwards with one tail similar to your snowman pattern, about 5 stitches, then weaved both tails throughout the scarf till it looked good to me. The scarf is not really a permanent attachment, but becomes a loop with one end hanging in front, and could likely be removed if someone wanted to. I'm doing the bear itself with a 3.75 hook (including appendages) and in a super soft snow white yarn. He finishes at just 2.5 inches tall. I'm doing the scarves in Xmas yarn, but a soft red or green would likely look as beautiful! To hang the bear, I simple thread about 4 inches of the yarn I used for the scarf through the top of the head and tied off. That way, again, if anyone wanted to they could just remove it and have this cute little bear year round. He really is gorgeous and everyone I know wants 5 of them! LOL he is a tiny bit more work and obviously more sewing than your original design, but as an option, he's really nice! I forgot to include that on the muzzle and tail I do of course slip stitch to join the last before finishing off - and as a personal preference, I sew those on inside out. I think they just look nicer that way. I "whip" them into place with the outer loops of the final round so they're raised. I'm working on my 2nd one now with this new method. When it's finished I'll pop over to facebook and put up a picture. I saw them and shared the photo, thank you! They are extremely sweet. I love the colors and your modifications are fab. Happy crocheting! How do you make the thicker arms for the teddy bear?